This easy 5.2-mile hike leads to a beautiful waterfall on the Hazel River. The falls are surrounded by towering rock walls and a couple small caves. Hazel Falls are not terribly high, but they sit in a beautiful gorge. Below: Adam at the Meadow Spring trailhead; Little wildflowers grew abundantly along the trail; A great place to enjoy the sun. Every time I think we’re running out of nearby hikes to complete, we seem to stumble across something that has escaped our notice for one reason or another. That was just the case with this beautiful, easy walk to Hazel Falls! 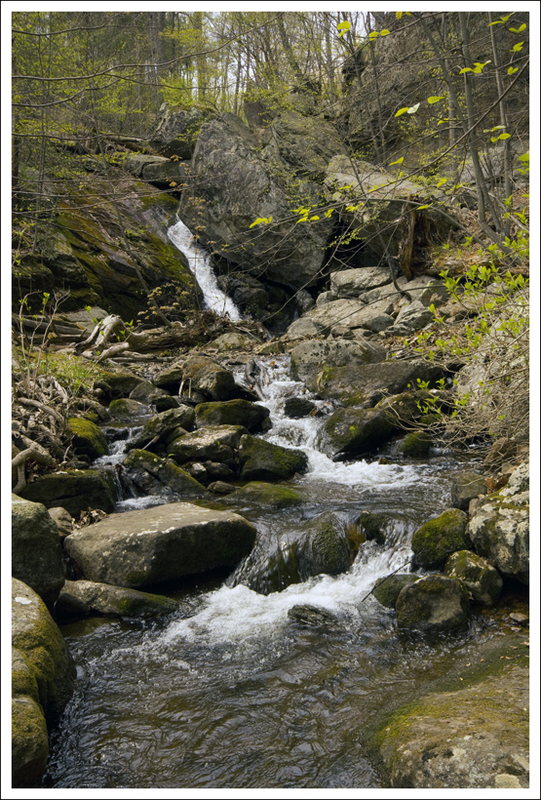 Typically, when you think of Shenandoah’s waterfalls, you think of Dark Hollow, White Oak Canyon or Doyles River-Jones Run. It’s not very common to see photos or hear people talking about Hazel Falls. After being there in person, I’m not really sure why. It was a great hike! Although the falls are not high, I found them to be nicer than some of the park’s more popular falls – I’m looking at you Lewis Springs Falls! It’s probably spring’s higher water flow, but this small waterfall was much more impressive than some of the park’s larger falls. The trail was mostly wide and gentle. Below: Adam negotiates the largest blow down on the hike; The junction of the steep rock trail that leads down to the falls/caves; Rock walls tower above the falls. The hike mostly consisted of pleasant, gentle walking through pretty forest. The last time we hiked in this area was a few years ago when we went on our very first overnight backpacking trip with PATC. That trip made a loop of Hazel Mountain and Catlett Mountain. It’s funny – I remembered the trail being a lot steeper than it seemed this time. I guess I had a heavier pack and wasn’t in very good condition on that trip. 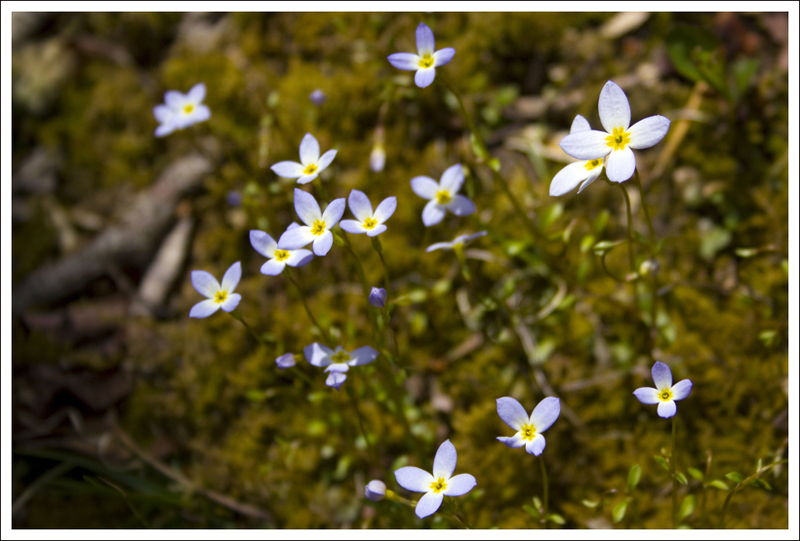 On this particular spring day, I enjoyed seeing all the early season wildflowers blooming along the side of the trail. We had perfect weather – sunny, crisp blue skies and a nice breeze. It was ideal for hiking, but not so ideal for waterfall photography. When we finally got down to the falls, I did the best I could to capture a few decent shots under the bright mid-day sun. It didn’t go that well. 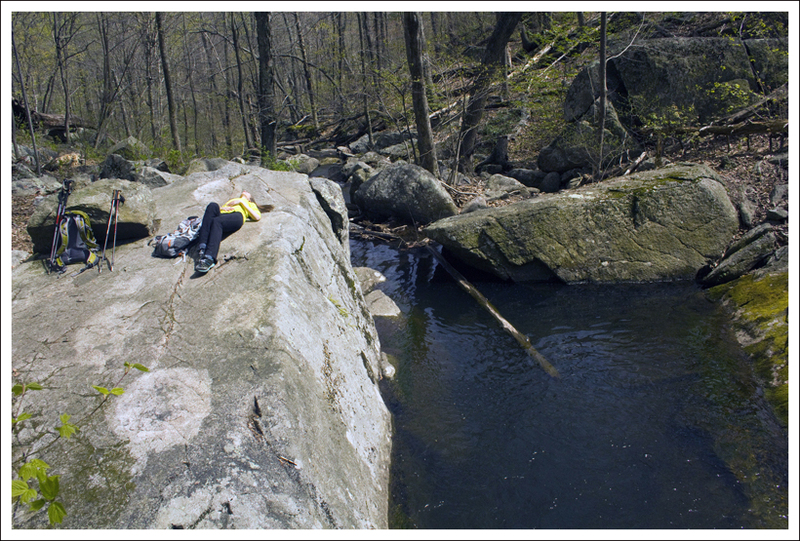 I also really enjoyed the little caves adjacent to the falls and sunning on the big flat rock next to the smaller falls. It was a gorgeous spot and I’ll look forward to visiting again. 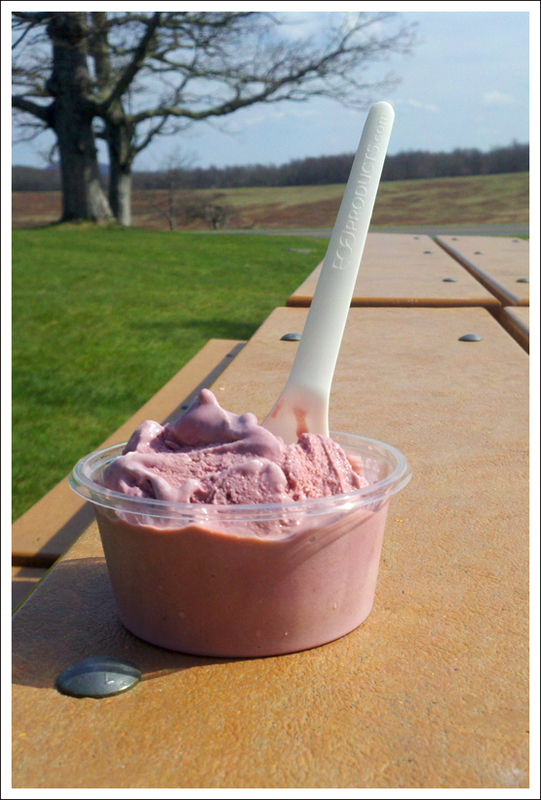 After our hike, we decided to stop by Big Meadows for Shenandoah’s famous blackberry ice cream. Even though the park has a new concessionaire for food/gift shops, the ice cream was just as good as it’s always been! The hike to Hazel Falls was a pleasant surprise. When looking for hiking suggestions, we typically peruse our hiking guides, study maps, and explore the internet for ideas. 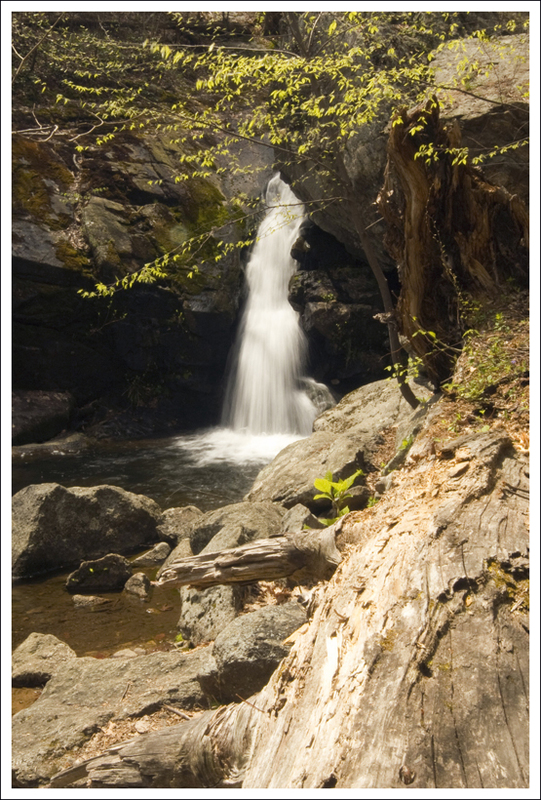 The 2000 edition of the Falcon Guide for Hiking Shenandoah National Park didn’t include Hazel Falls in the book, but the updated 2012 edition does cover it. So, we have to give thanks to Bert & Jane Gildert, the authors, for including this one for us to explore. As Christine said, I feel that this is a great waterfall that really allows you to sit down and take in the beauty of the setting around you. Adam enjoys the falls. Below: Adam makes his way down the steepest part of the trail; Pretty cascades leading away from the falls; Christine at the lower falls, Another view of Hazel Falls. The trail starts off from the Meadow Spring Trail parking lot. This is a popular parking spot for many hikes and overnight backpackers; we have rarely seen this lot not packed with vehicles. If you are going with a larger group, try to carpool to minimize the number of parking spots you may need. The good news is that most of the cars will likely be heading down to Buck Hollow or doing larger loops around Hazel and Catlett Mountains. 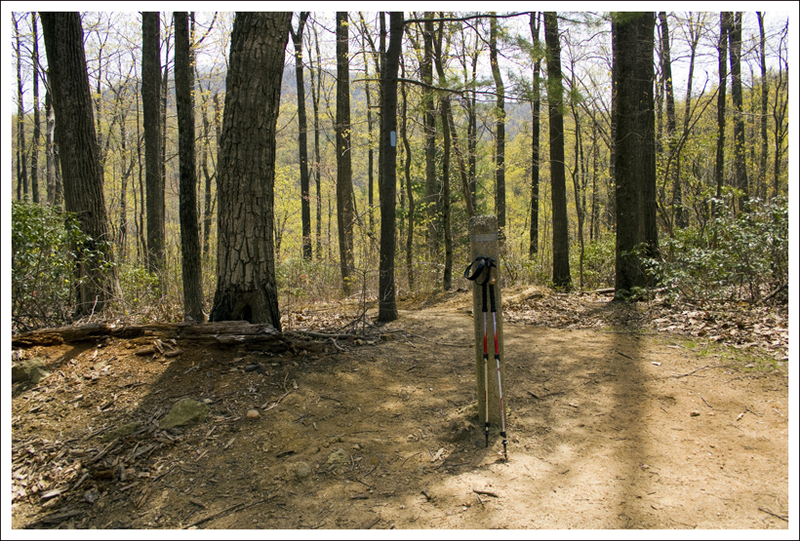 The trail goes just a few feet before you reach a junction with the Buck Hollow Trail. Instead of branching off, just stay straight on the trail and walk down the wide path. The trail is mostly a slight downhill grade with some flatter sections. At 1.5 miles, you will reach a junction with the White Rocks Trail on the left. Take the White Rocks Trail. At 2.4 miles, you will reach a junction post that will direct you to take the trail to the right for the falls. 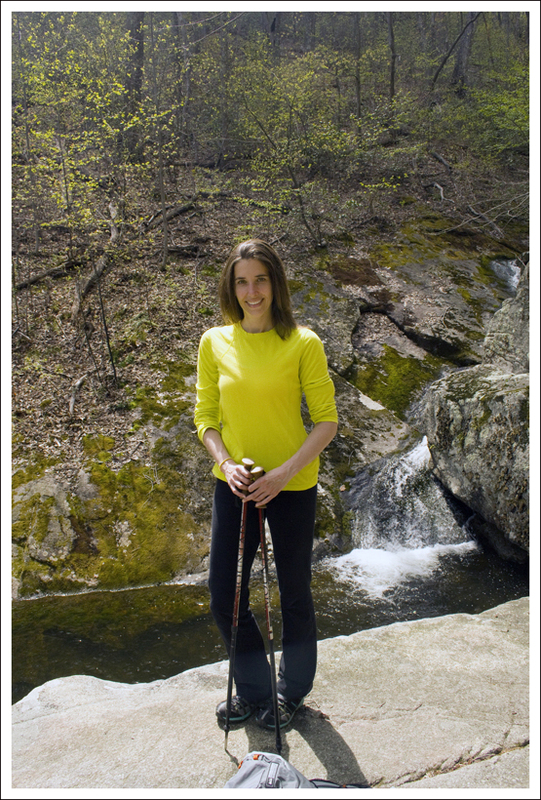 Climb down the steep trail and you should reach the first, small waterfall at the bottom. 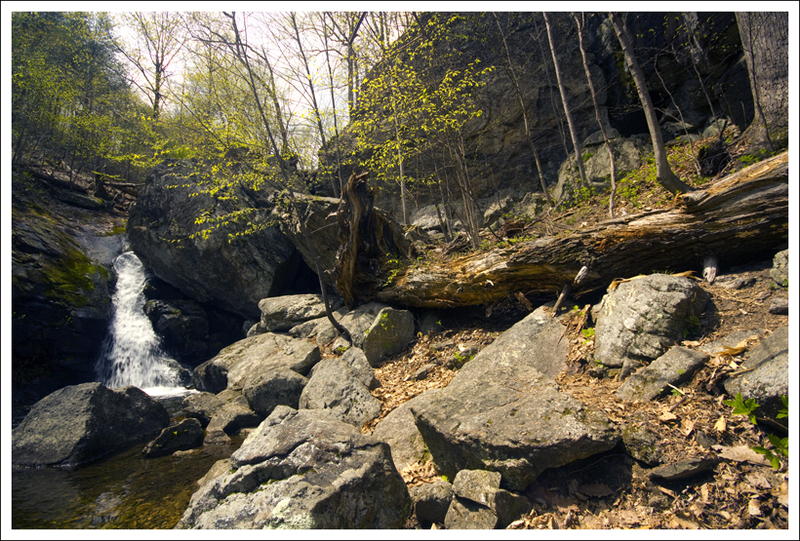 Continue along the path over the rocks and you will reach the larger Hazel Falls and see the cave to the right. Make your way back the way you came to get back to your vehicle. Because of the uncomplicated, mostly gentle terrain, this might be a great hike to do with older children. The only strenuous part of the hike was hiking the last .2 miles (the climb down will challenge your knees and the climb back up will get the blood pumping). 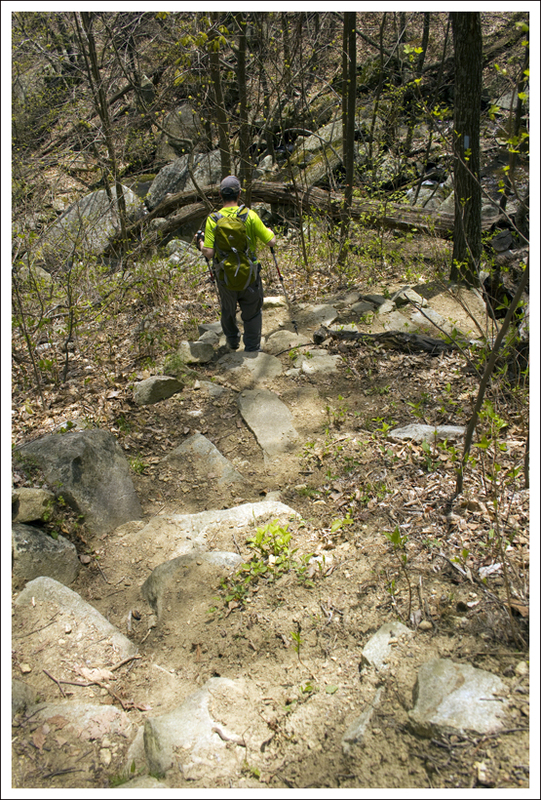 You can tell a lot of great trail work has been done to create the stone steps that allow you to climb down without it being too slippery. The picturesque setting of the falls will encourage you to take some time to relax, eat a snack, and enjoy the sound of rushing water. The pool at the larger falls could also be one to wade into fairly easily if you like getting your feet wet. 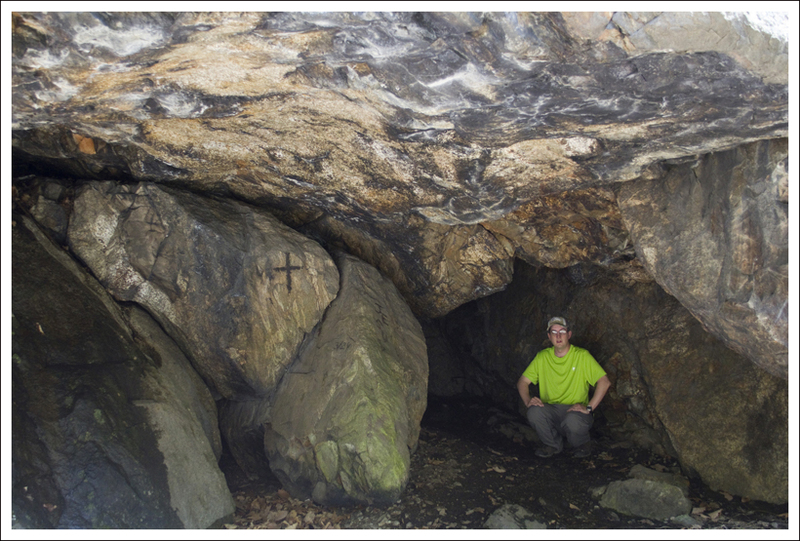 While Christine was busy taking a lot of photos, I enjoyed peeking inside the larger cave near the falls. Christine took some coaxing to go in, since she was worried that bats would fly out. I didn’t see any bats inside or guano on the ground, but I wouldn’t be surprised if a couple of them took refuge in the top of the cave on occasion. At the falls there is also a path that leads to a small rock opening that you can climb around to get closer to the falls. 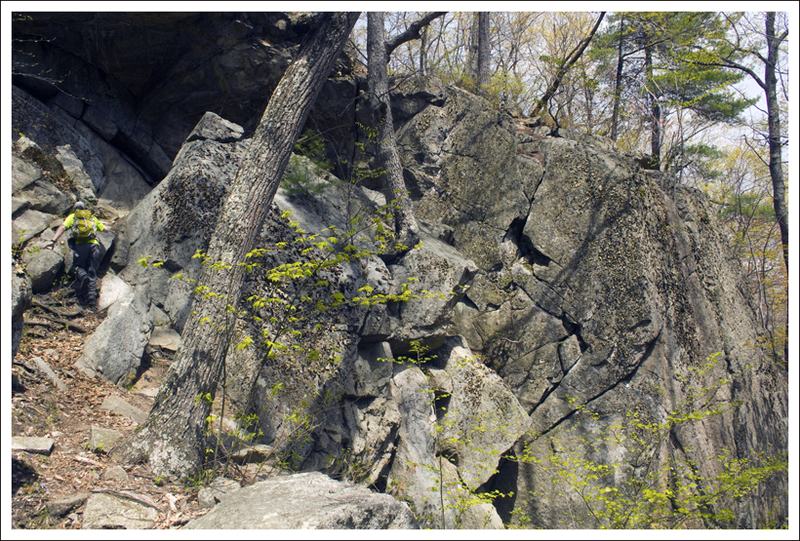 As I was climbing around there, I saw a bird’s nest tucked in the top of the rocks. Sure enough, within a few minutes, I saw a bird (I believe a sparrow of some sort) fly into the nest. I hope too many people don’t disturb the nest and it is able to raise some cute chicks. I imagine we will go back to Hazel Falls many times in the future. 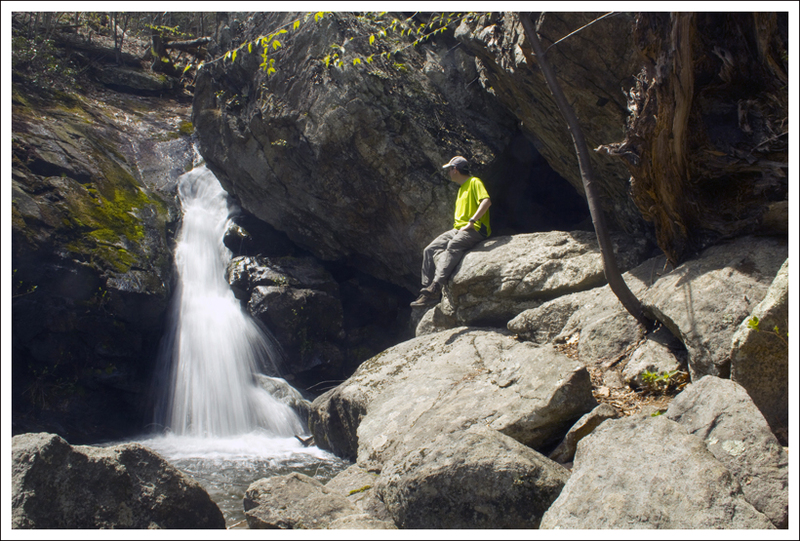 If you haven’t been here before, this is a waterfall that is worth checking out. Difficulty – 2. The final .2 mile descent (and climb back out) into the stream gorge is very steep, but the rest of the hike is flat or very gently graded. Trail Conditions – 3.5. 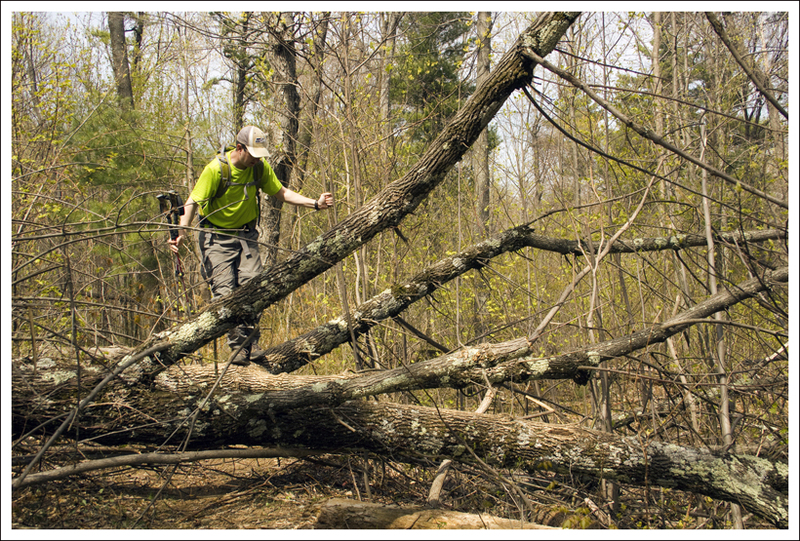 There were a few blow downs that required navigation, but most of the trail is smooth, easy footing. 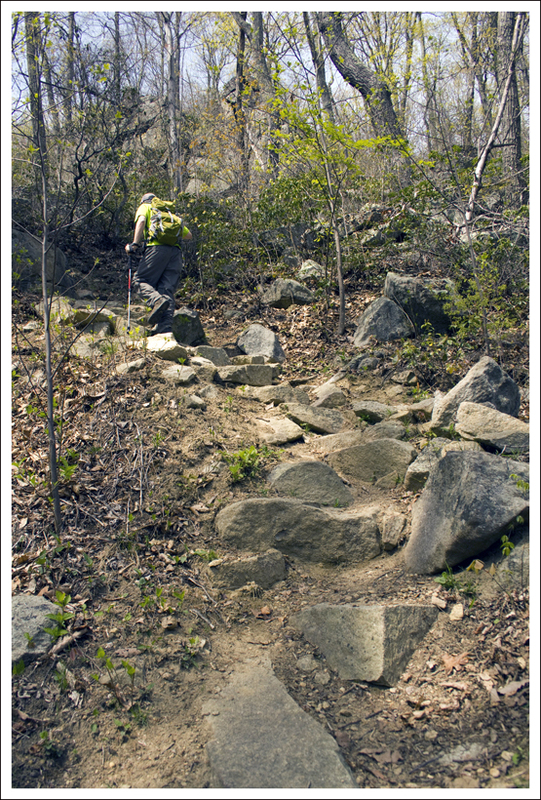 The descent to the waterfall showcases the great work trail maintainers do in the park. They turned a extremely steep piece of terrain into a giant staircase with a series of well-placed rocks. Views – 0. In the winter and early spring, you may catch some glimpses of mountainsides through the trees. Otherwise, this walk takes place exclusively in the woods. Waterfalls/streams – 4. Though the waterfall is not tall, it’s it a lovely setting surrounded by towering rock walls and small caves. Wildlife – 2. We didn’t see anything on this trip, but we have spotted bears and deer in the vicinity on past trips. Ease to Navigate – 4. Trail directions are clearly marked at junctions with cement markers. Solitude – 2.5. The parking lot was jam-packed on a pretty, sunny Saturday afternoon, but there are lots of trail options in this area. We saw about 15 people over the course of the hike. From Skyline Drive proceed to mile 33.5. Parking is on the east side of the drive at the Meadow Spring parking area. The trail descends from the south end of the parking lot. 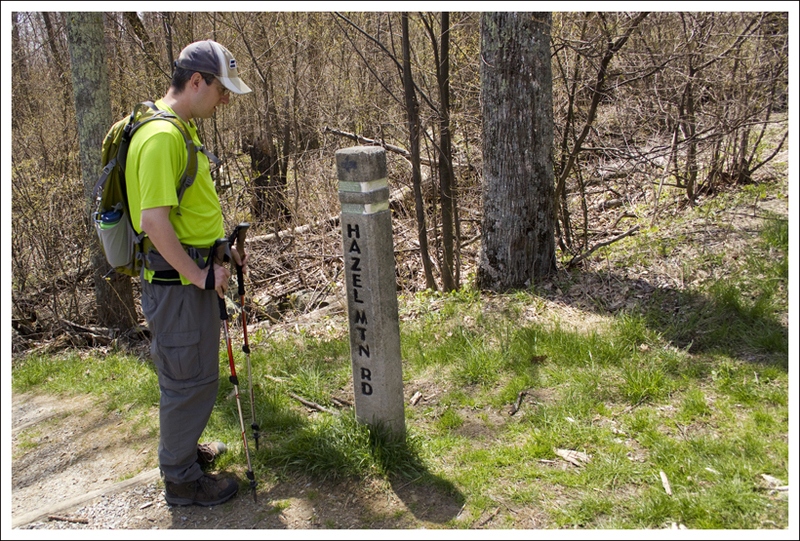 How easy would it be to get from the AT to a trail leading to Hazel Falls? Any fire roads/horse trails that connect? 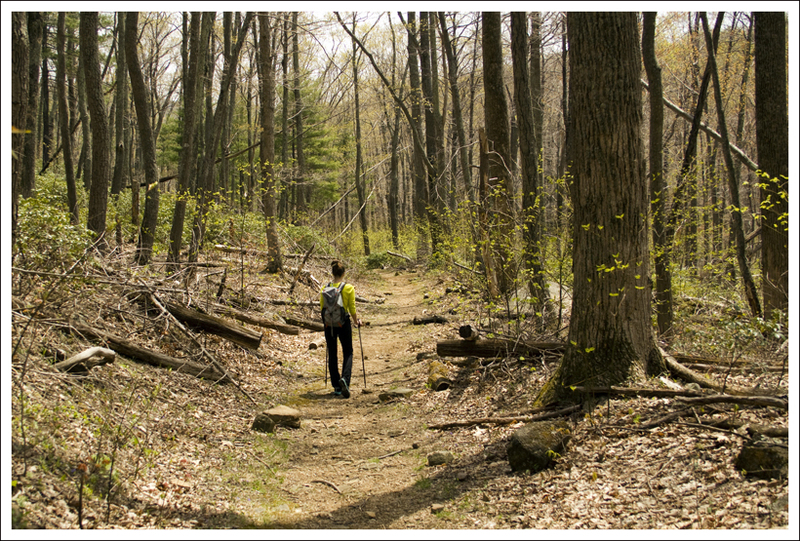 Probably the easiest way is to take the Meadow Spring trail from the AT down to Skyline Drive. From there, cross the drive and you’ll be at the start of the Hazel Falls hike. Thank you for your excellent report of this hike. Very helpful for hike wife and I are planning for next May 2018. Especially appreciated the elevation change info. and the mileage splits. I’m glad the post was helpful! Let us know how you like the hike!